Choosing organic foods is important for all members of your family, and you can even find organic parrot food for your favorite feathered friend. Organic pet food is an important choice to make for all the same reasons it is important to choose organic foods for the humans in your household. It's possible that organic foods are more nutritious than their conventionally produced counterparts. In the case of animal foods, it is almost certain that the organic choices will be healthier because they lack the chemicals, animal byproducts and fillers that are usually found in conventionally produced foods. Because all of the ingredients that go into organic food - whether for parrots or dogs - are made without man-made chemicals, they are better for the health of your animal as well as the health of the planet. Given the extra cost, it may seem like choosing organic pet food is not a significant choice that is really worth it in the long run. If you are interested in the long-term health of the planet, however, anything you can do to cut down on pesticide use is going to make a difference. Before you hit the Internet to buy organic parrot food, check your local pet food stores and natural food stores to see if they have any options available. Buying locally is another good thing to do because you're supporting local business rather than giving money to someone in another state. Many small pet stores are proud to offer choices that aren't available at the bigger pet food chains, and they are often willing to start carrying products if customers ask for them. If you happen to have access to a store that is especially for bird lovers, you may be able to convince the owner that there is a market for organic food. BirD-elicious has a variety of foods for parrots and other birds that contain natural and organic ingredients. Most varieties do not contain sunflower seeds, but they do contain tree nuts. You can choose food for particular age ranges, health problems or for your species of bird. Your Parrot Place sells all sorts of food and toys for parrots and other companion birds. 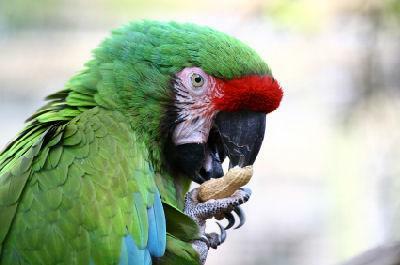 Brands for parrot seed include Totally Organics and the all-natural Noah's Kingdom. Avian Naturals uses all natural, organic, human-grade, freeze-dried fresh vegetables as the base of its parrot food, and it includes no preservatives, additives, coloring or sugar. Gourmet Parrot makes organic, human-grade parrot food pellets and seed mixes. There are also many options for people who want to make their own organic parrot food. You can buy organic produce and nuts from your local natural food store and mix them yourself to feed your bird, or make your own bird breads. Many different recipes for parrot food are available online; check out It's a Grey's World for recipes for muffins, fruit pizza and more that both you and your feathered friend will enjoy. Getting your animals back to what they would eat if they were living on their own is often a great way to ensure their continued good health, as well as the health of the planet.